BASSETERRE, St. Kitts – THE National Housing Corporation, in collaboration with the Team Unity Government, continues to keep the promises made to the people of St. Kitts and Nevis by delivering more affordable homes to qualified and deserving people. A handing over ceremony held on August 21st in Molineux, saw 30 individuals receiving keys to their brand new homes. The homes are located throughout Constituency Number Seven. 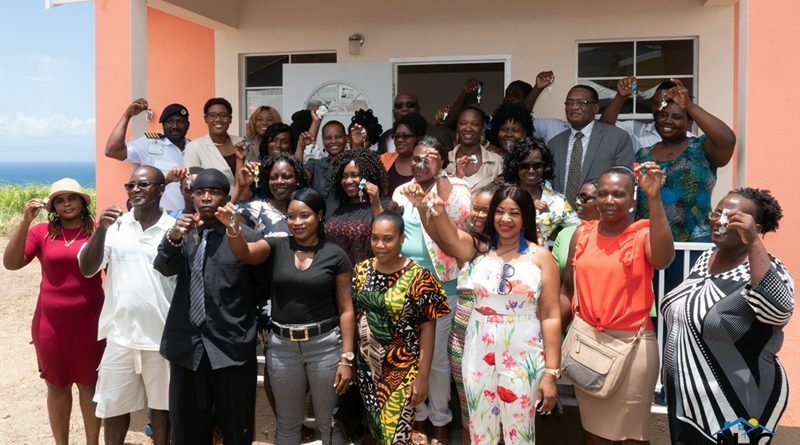 In distributing the keys, NHC’s General Manager, Elreter Simpson-Browne said that NHC’s mandate of ensuring lower-income families are given the opportunity to own a home was improved by the Team Unity Government. “Under this Unity Government, our less fortunate citizens and residents including the poor and the indigent, are now on par and can boast of the turn-key experience that is bigger, stronger, contemporary, more affordable and lavished with the requisite amenities for relaxed and contented living,” she explained. She noted that NHC’s mandate under the Team Unity Government has caused the corporation to exceed expectations. Natasha Daniel, Director of NHC told the guests at the handing over ceremony that it is always heartening when a promise is delivered upon, adding that today’s ceremony is just a continuation of the Team Unity Government “making good on its commitment” that it made to the Federation. “Being able to spend your time and money towards a place that you can call your own is very empowering,” she said. Minister of Human Settlement et al, Hon. Eugene Hamilton encouraged the new home owners to care for and to keep God in their homes. “I want to urge you that as we give you these beautiful homes with a hard roof made of galvalume, bigger bedrooms, low-interest rates that you take care of these properties,” he encouraged. Prime Minister and Parliamentary Representative for Constituency Number Seven, the Hon. Dr. Timothy Harris, congratulated the new homeowners and encouraged them to keep the peace in the neighbourhood. He further encouraged them to meet their monthly obligations so as to keep the arrears at a minimum, adding that if they are unable to pay their full mortgage amounts, a small payment bit by bit until the full amount is paid will also work. “If it is $200, pay it, and when you get more, you pay more. At least you keep the arrears down and you show goodwill and intent to honour your obligation,” urged Harris. The construction of the houses forms part of a $50 million loan provided by the Social Security Board to construct 300 homes across St. Kitts. The next handing over ceremony of keys will be on Thursday (Aug. 23) in La Guerite.